Note: Unfortunately, this page is currently not compatible with mobile view; everything gets jumbled. ​Please use view full website (computer or tablet). 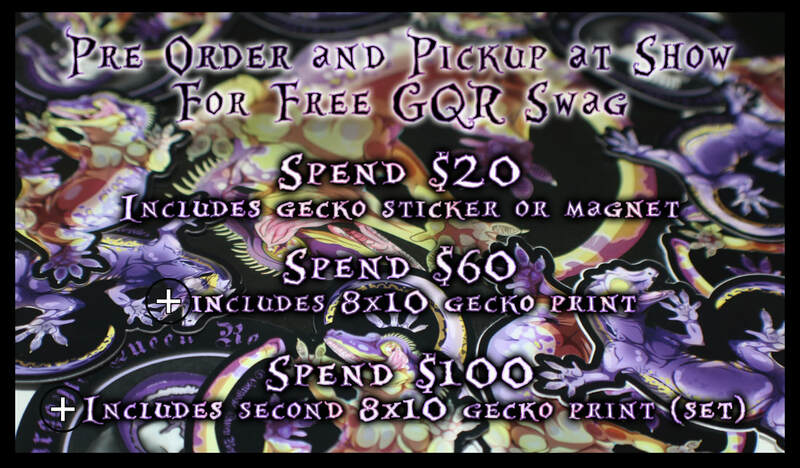 ​we are offering free GQR swag with pre-purchase in tiers. If you need the product shipped, please contact me for shipping costs. I cannot ship for free, but shipping cost ranges from $5-15 depending on order size. This is an opportunity to make payments without payment plan limitations. The catch is once you have a specific gecko reserved, the limitations then apply (more info on terms page). For those who want to receive this as a gift, let your gifters know! You can combine gift certificates when making your purchase! 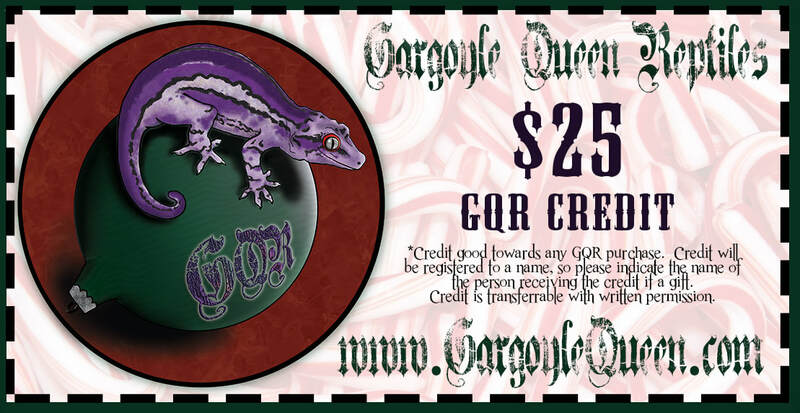 This is also a great way for you to break up a payment if you normally can't spare the funds for the full amount of an average GQR gecko at once (or within two weeks). Email me to purchase (kylie@gargoylequeen.com) or if you need clarifications! Please specify name of the person who will receive this so I can assign them the credit (it can be yourself, I won't judge). If you would like a different amount than listed below, just let me know; it's customizable! If you would like a shipping quote for planning purposes (generally ~$45-65 depending on location; may fluctuate +/- $5 depending on timing), let me know. Upon purchase, you will receive a PDF file that you can print out to have a physical thing to gift. Those don't need to be sent in, the giftees name will be noted for redemption. ​*Credit expires one year after purchase. This is what makes New Caledonian geckos so great. 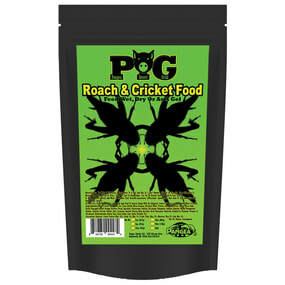 They can thrive on this diet without any insect supplementation. However, it is recommended that you feed your geckos supplemental crickets or dubia roaches once or twice a week for the best growth rate. 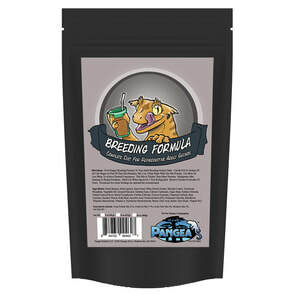 The product is suitably formulated for any New Caledonian Gecko, Phelsuma and Gekko species. 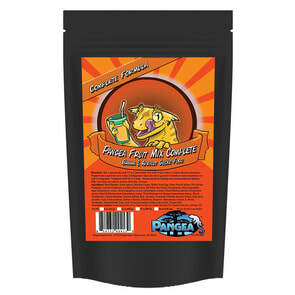 PFM™ Complete Diet Pangea Crested Gecko food uses a combination of fruits that your geckos won't be able to resist. It has been formulated using only the highest quality ingredients, including All Natural Dried Fruits, Whey Protein Isolate, Egg White, Bee Pollen, Spirulina, Probiotics, and more. All ingredients are selected to contain very low levels of Anti-Nutrients like Oxalates and Phytates. PFMC does not contain any seeds, nuts, seed meal, cereal grains or high oxalate fruits or vegetables in any product. Don't see what you need? Send me an email at kylie@gargoylequeen.com with a request for an item and size and I'll get it stocked for you. 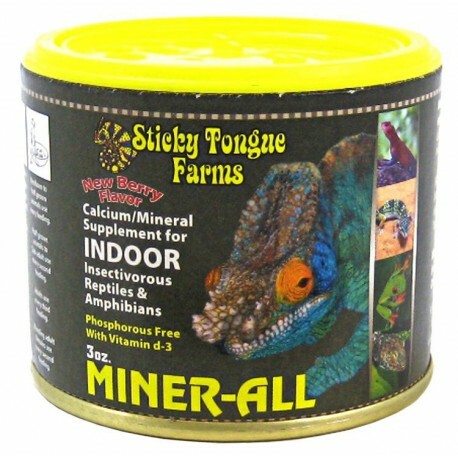 Miner-All formula with vitamin d-3 for insect eating reptiles and amphibians NOT exposed to natural sunshine, is the only high quality human grade calcium based product scientifically formulated with over 50 vital minerals ensuring optimum health and bone strength. Miner-All is ground to a micro fine powder sticking to all insects. 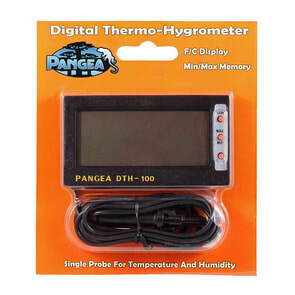 Removes chloramines and chlorine, detoxifies ammonia and nitrites, and provides essential ions and electrolytes which help to hydrate newly acquired animals. 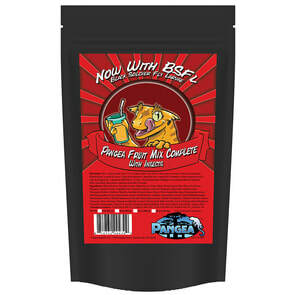 Just add to water intended for use with your reptiles and amphibians. 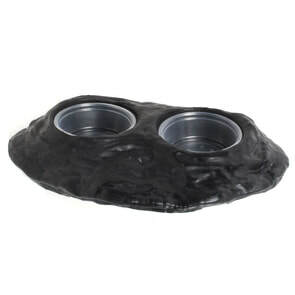 The large Pangea feeding ledge is perfect for any gecko. Holds both a food and a water dish. 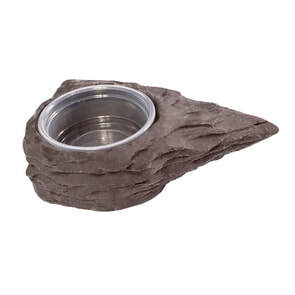 10 disposable cups are included with this ledge, but it does hold standard 2 oz cups as well. 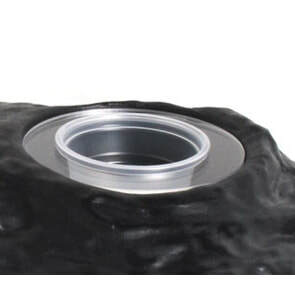 Made from a dense non-porous material that is easy to clean. The small hanging plant is approximately 12" long and is easy place with included suction cup. Easy to clean and looks nice in any enclosure. Types carried are Mexican Phyllo (pictured) and Congo Ivy. Will be able to select which style in person. The medium hanging plant is approximately 18" long and is easy place with included suction cup. Easy to clean and looks nice in any enclosure. 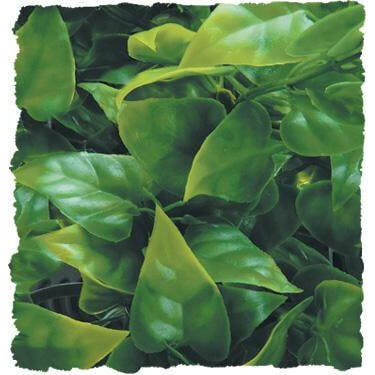 Types carried are Mexican Phyllo and Congo Ivy (pictured). Will be able to select which style in person. 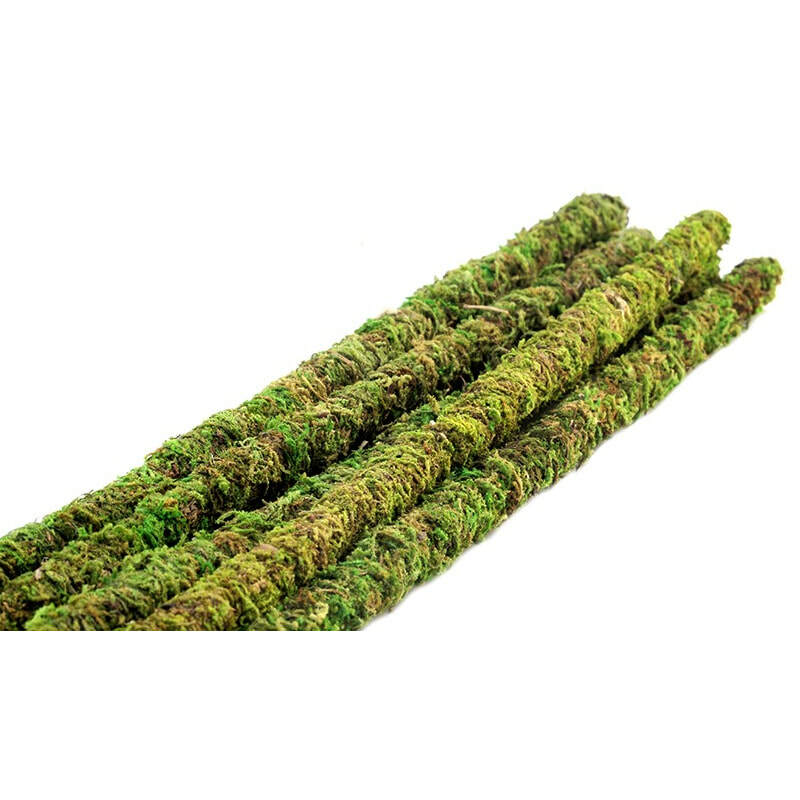 These mossy sticks have a wood core that is not very flexible. 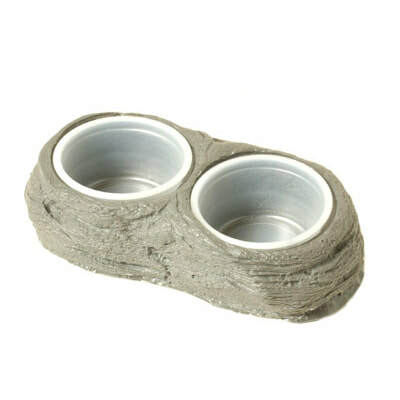 This helps create solid perches when secured into your enclosure. The moss is not live and is a bit messy, but look nice do last quite a while. These sticks come in a pack of 6. Monitoring your reptile's environment for temperature and humidity is one of the fundamentals of good reptile keeping practices. Thick, bendable and easy to climb. This 12 foot vine has a wire core that can be cut into sections with a wire cutter. 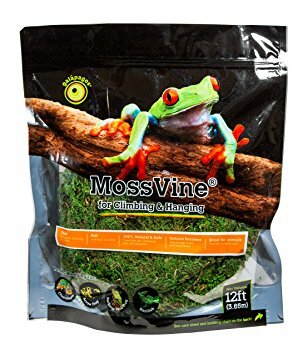 Soft moss (non-living) and easy to clean. 100% safe, free from salt, chemicals, oils and parasites. Natural enzymes discourage mites and stop odors. This 14x30" rope ladder is composed entirely of natural materials. Can be cut into smaller sizes. Combine with other furnishings to provide a secure, and fun 3D environment for your gecko! Product is washed and cleaned to remove dust and particles. Chlorhexidine gluconate is a very effective bacteriacide, virucide, and fungicide. 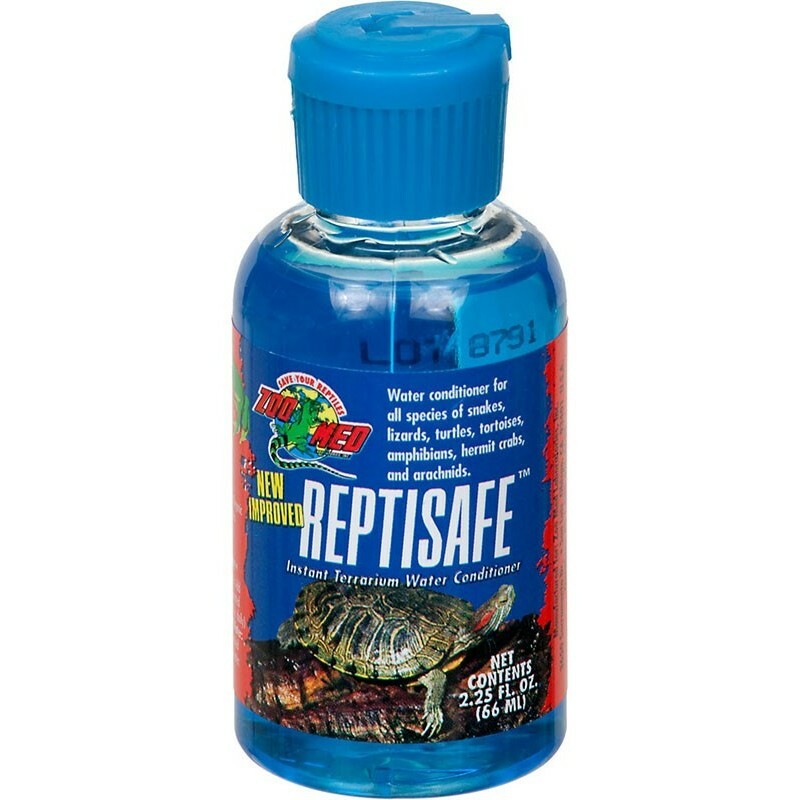 100% safe to use in reptile cages because it leaves no toxic residue or fumes. No rinsing necessary; just spray and wipe. For best disinfecting results, spray on cleaned surface, let soak a few minutes, then wipe dry. 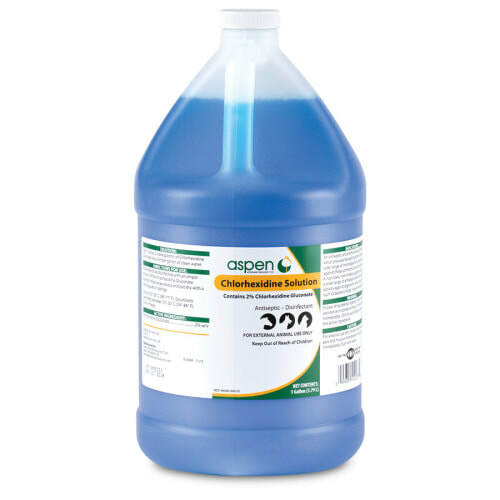 Dilution rate for Chlorhexidine: 1 ounce (2 Tbsp) solution per 1 gallon of clean water. Bottle makes 2 gallons. This product is for a more thorough/deep clean application. It is an animal approved bacteriacide, virucide, fungicide, mildewicide, and deodorizer all in one. We use this for our deep cleans 3-4 times a year. 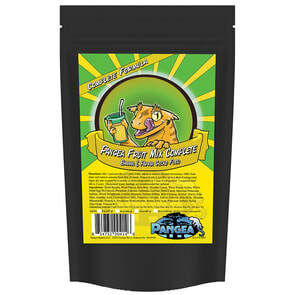 Apply a use solution of 1/2 oz of this product per gallon of water. Use dilution to disinfect surfaces by immersion or sprayer. For spray applications, spray 6-8 inches from surface and avoid inhaling vapors. Treated surfaces must remain wet for 10 minutes. Wipe dry with a clean cloth or allow to air dry. Bottle makes 4 gallons. All photos, images and content are © 2011-2019 Gargoyle Queen Reptiles (and on this page, Allen Repashy). All rights reserved.